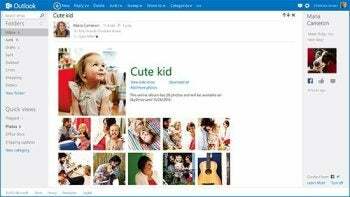 Hotmail users and newbies are flocking in droves to Outlook.com, Microsoft’s latest Webmail overhaul that will eventually replace Hotmail. Less than 24 hours after Microsoft rolled out Outlook.com, one million people were already using the service, according to an official tweet from Microsoft. The new Outlook continues Microsoft’s overhaul of all its Web properties to the new touch-centric Metro feel — the same look that’s coming to the Windows 8 Start Screen and is already on Windows Phone. 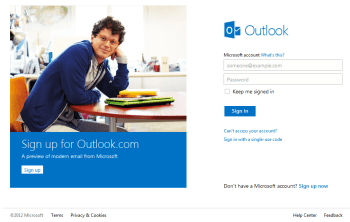 If you’re a Hotmail user looking to switch back to Microsoft’s platform and don’t want to be caught dead sending mail from a dated Hotmail.com address, you can use an Outlook.com e-mail instead. There are two ways to do this: make a permanent switch to Outlook.com or create an alias. Let’s say Joe Smith wants to switch his Jsmith@hotmail.com to J.smith@outlook.com. His first step would be to click on the settings cog in the far right corner of the inbox and select “More mail settings.” On the next page, he would select “Rename your email address” under the heading “Managing your account.” Then, on the following page, Joe would be able to rename his Microsoft account to an Outlook.com address. Microsoft says it takes a few days for other Microsoft services such as SkyDrive to switch over to the new address. WARNING: Windows Phone users may not want to make a permanent switch with an account tied to a phone. If you do, you won’t be able to use Marketplace, Xbox LIVE, SkyDrive, e-mail and other Windows Phone services. To get these features working again, you’ll have to restore your phone to factory settings, erasing all your personal content from the handset. The other alternative is to leave your Microsoft account as is and create an alias address. This works just like a regular e-mail address, allowing you to send and receive e-mail. But you can’t sign in to Outlook.com or any other Microsoft service using this ID. You also have to select the Outlook.com address each time you write a new message since the default will be to use your old Hotmail or Live.com email. 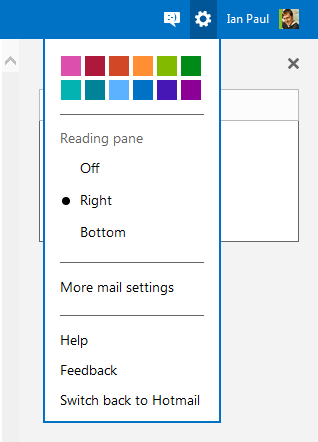 To make an alias click on the Settings cog in the far right and select “More mail settings.” On the next page, select “Create a Outlook alias”. Once you choose an alias, you can decide whether to filter the messages to a special folder or straight to your regular inbox. From Outlook you are also one click away from your contacts, Calendar, and SkyDrive. To navigate to each different service hover over the Outlook logo in the top left corner of your inbox and select the downward facing arrow. Reminiscent of the Metro version of Internet Explorer 10, a dropdown bar will appear with Metro-style tiles you can select to navigate between services. In my tests, only your contacts — renamed People as in Windows Phone and Windows 8 — are updated with the new Metro look. Your calendar and SkyDrive are using the old design for now, but visual overhauls are expected soon. 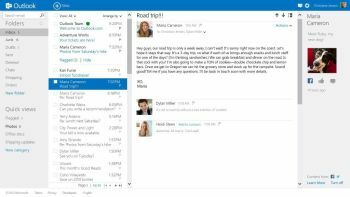 Microsoft has a made a dramatic leap forward in visual appeal with Outlook.com and more plans are in the works for the overhauled service including Skype integration. If you’re a longtime Hotmail user who gave up on your old address for Gmail, GMX, or some other service, you should revisit Hotmail and give the new Outlook.com a try.